1. The applicant must be attending an U.S. accredited college or university in September 2016 on a full time basis (12 credit hours or more). Applicant may be new student (freshman) or returning student (sophomore-senior). Once an applicant wins award they are ineligible to apply for future awards. 2. The applicant must submit a word document, confidential and un-returnable application provided in print, electronically or online to the Scholarship Committee. 3. Incomplete applications will not be considered. 4. Applicant should be preparing to enroll or already be enrolled in a program in Historic Preservation or a related field, which can include, but not be limited to ; Archival Science, Library Science, Building Preservation, History, American Studies, Education or Museum Studies. 5. The applicant’s eligibility will be based on the application materials, academic performance, community service and promise shown for future achievement, based on the judgment of a review panel. 6. The award will be applied towards school tuition and is paid directly to the college or university. 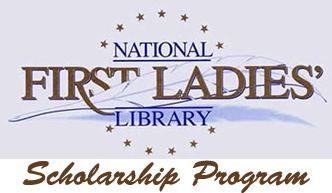 or emailed to pkrider@firstladies.org . Email is preferred. Four students were chosen to receive a $1000. scholarship each to apply towards the college of their choice for the coming year. Six students were chosen to receive a $1000. scholarship each to apply towards the college of their choice for the coming year. Rachel Littler, Cleveland, OH Malone Univ.